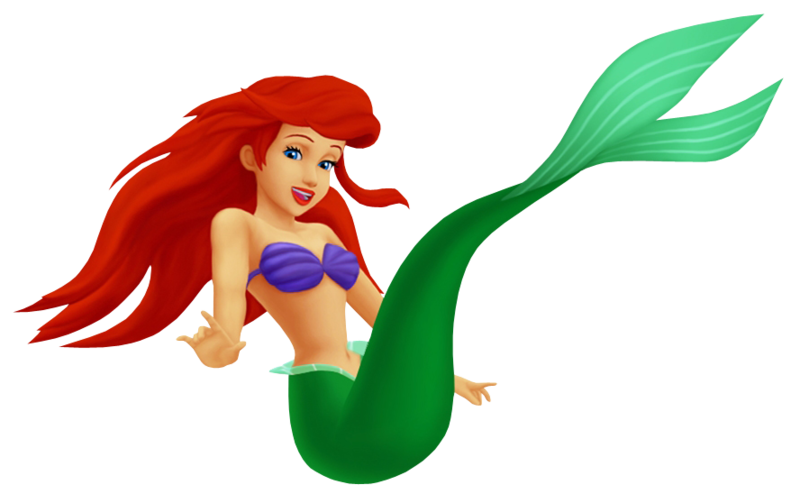 The fiery redheaded princess of Atlantica, Ariel is a headstrong and rebellious mermaid whose yearning to see the outside world makes her a reflection for Sora and Riku. She is wary of the Heartless plaguing her kingdom, but being naturally naive, she does not hesitate to join forces with newcomers Sora, Donald and Goofy to search for her world's Keyhole. When the Crystal Trident is destroyed by King Triton, she attempts to escape from the suffocating influence of her father, only to fall victim to Ursula the Sea Witch's manipulations. Tempted by the possibility of finally being able to step beyond her undersea kingdom, Ariel agrees to bring Ursula into the palace. She soon realizes that this is a grave mistake when Ursula grabs hold of the trident and proclaims herself ruler of the seas. Seeking to make amends, Ariel helps Sora, Donald and Goofy defeat Ursula and reclaim the trident. It is revealed that the Keyhole of Atlantica is hidden in her grotto of human treasures, presumably drawn to the place by her deep yearning. Though any hope of leaving her home seems far and out of reach, Ariel knows in her heart that she will one day be part of the outside world. Rebellious and full of life, this mermaid princess of Atlantica longs for nothing more than to be part of the outside world beyond her undersea kingdom. During a stormy night, she saved the drowning Prince Eric and brought him to shore, falling in love with him in the process. However, as contact between humans and merpeople are strictly forbidden, she fled before Eric fully regains consciousness, leaving him only with a memory of her enchanting singing voice. When Sora, Donald and Goofy return for their second visit to Atlantica in Kingdom Hearts II, they find a depressed Ariel in the midst of Sebastian's concerts. To cheer her up, they bring her a statue of Prince Eric, but the happiness is short-lived when King Triton finds out about her illicit romance, and destroys her grotto. Emotionally shattered, she is susceptible to the manipulations of Ursula the Sea Witch. She exchanges her voice and tail for human legs, and is given three days to receive a kiss of true love from Eric otherwise she will belong to Ursula forever. Though mute, Ariel is able to steal Eric's heart (figuratively speaking), but her happily ever after is nearly thwarted by Ursula's interference. Sora, Donald and Goofy defeat the sea witch, but Ariel has already been turned back into a mermaid. Despite this however, a blessing from her father and Eric's ability to accept her undersea origins frees her to finally be part of the human world.